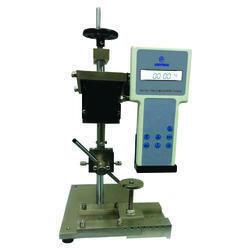 We are the leading manufacturers and exporter of Digital Force Measuring Gauge and our product is made of good quality. Measures compression (push) or tension (pull) forces, this measuring gauge is manufactured with ultra-modern manufacturing unit using quality approved material and progressive technology in adherence with defined quality standards. Our offered measuring gauge is provided in several specifications according to the demand of customers. Our measuring gauge is highly admired in the market for its excellent quality. Looking for Digital Force Measuring Gauge ?